Major League Lacrosse - MLL is professional men's field lacrosse. With some of the very best Lacrosse athletes in the world. 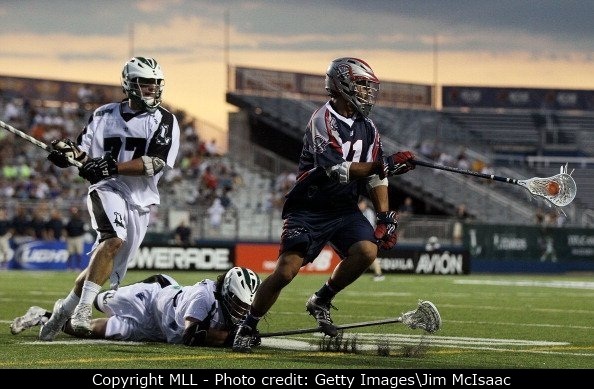 The MLL plays a very exciting and entertaining style of lacrosse. The game is extremely fast paced with some unique rules like a 2 point shot line and 60 second shot clock. I absolutely love the field version that the MLL plays and if you are lucky enough to be in an area that has a team, I highly recommend that you attend a game in your area which are played from April through August with playoffs and a championship game held at the end of the season. This is another super smart aspect of the MLL and that is that it doesnt interfere with the regular field season for the rest of lacrosse which means it is the only lacrosse game in town when it is going. Also in 2006 the league expanded West adding franchises in LA, San Francisco, Denver, and Chicago. In 2009 with the struggling US economy much to the dissappointament of the west coast lacrosse crowd, gone were the west coast teams. The MLL shrunk to just 6 teams and reduced to 1 division. Gone were the East and West divisions. A new Franchise Toronto was added for that year. A few teams have come and gone since then. Unfortunately the league still greatly lacks a West Coast presence, and remains (with the exception of Denver) an east coast oriented league. I am hopefull that some west coast sponsorship will come along and again make it viable for some west coast teams. Media coverage is fairly good, and many games are televised in HD, and all are available on-line. You can check out the latest TV schedule on the MLL website.